I took a ride out to Whiting this morning and saw no evidence of any mishap at any of the crossings, Lacy Rd, Diamond Rd, 539. I was thinking that the truck did some damage and was parked on Cherry St. waiting police for a report. As I posted earlier Cherry St made no sense to me. I even checked out the dirt paths off cherry St. in case the truck backed too far down, nothing! Was able to get back out again yesterday. I could be wrong but it seems as if the whole line from a little south of Lakehurst To the crossing at Savoy/Mcmahon rd. Has been re-ballasted. The line looks better in some spots than some still In service portions of the southern secondary. Came across this on a facebook post today. Newly posted video of CMSL freight transfer at Tuckahoe earlier this year. SIRT - "Ride the Rapid"
They still storing freights cars on the CMSL? The last time that I was in Tuckahoe, there were cars on both the Cape May and Beesleys Point branches south of the station. Obviously nothing has moved to the power plant in ages. Thanks for the info. Does this railroad haul freight on a regular basis? Sand or gravel it’s main product? I’d like to get some pix of operation soon during a trip to the area. Last edited by Jeff Smith on Mon Dec 31, 2018 5:59 pm, edited 1 time in total. I don't think that CMSL has any regular customers in South Jersey at this time. There was a propane dealer in Woodbine that I believe took deliveries for a while but that has apparently ceased. Their main business is car storage and seasonal passenger operations between Tuckahoe and Richland. 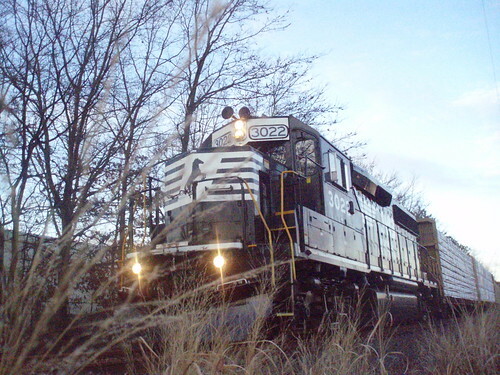 I continue to hope for CMSL's success given Tony Macri's devotion to keeping rail alive in southern NJ and the friendly operation that they maintain. Wasn’t there a guy transloading sand at Tuckahoe for a while? Did that, too, dry up? Last edited by Jeff Smith on Mon Dec 31, 2018 6:00 pm, edited 1 time in total. Has anything changed? I’m still hoping to get some freight train action shots in May. I crossed the Southern Secondary, which feeds into the Clayton's ROW, at Whitesville Rd. last Sunday and there is still a considerable amount of tall grass between and around the rails. Last year February, I saw pine trees over 6' tall growing in the middle of the tracks at the Renaissance Grand Village just North of Rt. 571 and South of Whitesville Rd. Given this information, I highly doubt trains will run through Lakehurst within the next few months. Without the generating station, what rail customers are left for CMSL in Atlantic and Cape May counties? The generating station is a CSAO customer, not a CMSL customer. Dcell wrote: Without the generating station, what rail customers are left for CMSL in Atlantic and Cape May counties? To the best of my knowledge, CMSL does not have ANY rail customers. They store freight cars at the start of the Cape May Branch in Tuckahoe, but that is it. Now that the power plant at Beesley's Point will be officially shutting down, and DuBell Lumber in Blue Anchor has closed, there aren't many remaining rail customers along the Beesley's Point Secondary (south of Winslow Junction) for CSAO either.